Bremen - After what must have felt like a lifetime, FC Bayern München captain made his long-awaited return from injury in Matchday 25's crushing 4-0 win away to SV Werder Bremen. Question: You returned to the pitch for the first time after four months out injured. How did you enjoy your comeback? 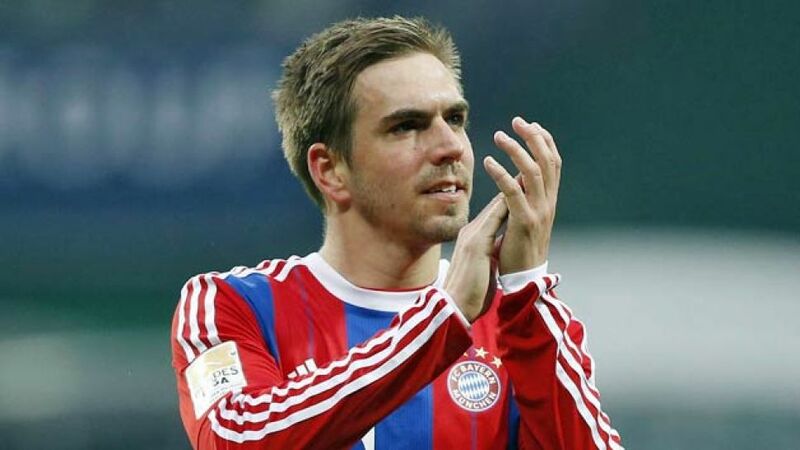 Philipp Lahm: Obviously it was great. When you’re out for four months and spend so much time in the weight room, you can’t wait to get back on the pitch again. Question: Watching from the bench, what did you make of the performance prior to your introduction? Lahm: It wasn’t a given that we’d put in a good performance. We had a crucial game in the Champions League [against FC Shakhtar Donetsk] on Wednesday that we’d put a lot into. It’s not easy to then play in the Bundesliga at the weekend when you’ve got such a big lead and you have to play away. The team deserve credit for the way they went about the game. It was already 3-0 when I came on, which was great (laughs). Question: The game got pretty heated at times in the second half. Did it cross your mind you might pick up another injury when you came on? Lahm: No. Actually there’s nothing wrong with my ankle anymore, even though I had something on under my socks. Question: Are you surprised to have returned to the team so quickly and to have already made an appearance from the bench? Lahm: It wasn’t like I hadn't been on the pitch the whole time. The coach really wanted to have me in the squad on Wednesday, so it was a given that I’d say ‘yes’. There wasn’t much else I could do - a lot of players weren’t available. Question: When will you be fit enough to return to the starting line-up? Lahm: We’ll have to see. There’s a week until the Gladbach game. That’ll probably be too early. Then there’s a two-week international break when I’ll be able to just train. Then I’ll be fit again. But we’ll have to wait and see. I’m completely pain-free. Question: Can you believe how dominant Bayern are in the Bundesliga? You were playing against a team that had picked up as many points during the second half of the season as Bayern after all. Lahm: It certainly shouldn’t be taken for granted, but we train together every day and the coach has a clear vision and knows what he wants. Sometimes he changes his tactics during games. The quality of the players is also outstanding and the goals were fantastic. Thomas Müller finishing a break on his weaker foot - not everyone can do that. And not everyone can strike a free-kick like David Alaba. The team are always on their game, though, and they don’t slack off. Even after an important Champions League game, they’re still hungry. They keep focused. Lahm: Yes, that’s right. It’s not easy for the opposition because they know they can’t afford to give away any unnecessary fouls on the edge of the box. Right now David’s got a good hit rate, but I doubt he’ll stick away every free-kick (laughs). Question: Bayern were without 'Robbery' for the first time since the 0-0 draw in Gladbach. Is it more difficult for the team when Arjen Robben and Franck Ribery are missing? Lahm: It’s different, without a doubt. They’re two brilliant players, who are really strong in one-on-one situations, so we have to adapt our playing style a little. It’s something the coach also does really well and the players like the fact that Pep [Guardiola] can send us out looking to implement another style of play on the pitch.